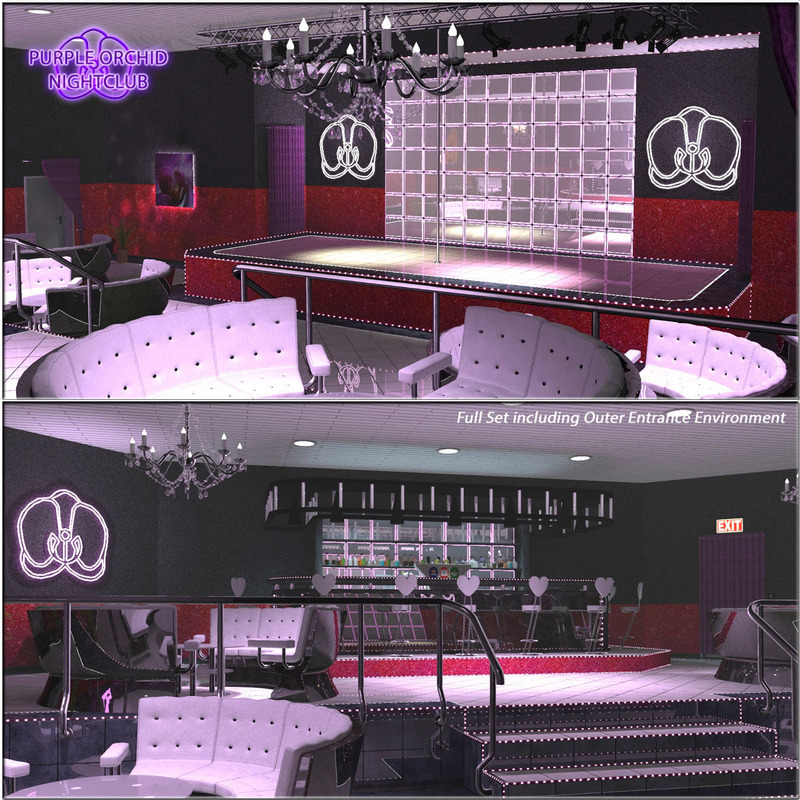 Welcome to our Nightclub “The Purple Orchid”. This stylish Establishment will serve and host your figures nicely for a wonderful night out there. The set comes as a combination of the interior room including Props, Lights and Cams plus the hallway to the outside and the Outside Door Theme. Rem. : Product designed for Poser. Loads OK in D/S with a few limitations, please check readme. Check out our big freebie area. We are processing free pose sets for this product. Here you get our first Attic Room for the supervilla sets. Even though this is part of the series, it will work as a standalone package. lense shots. Included are completly setup rooms with day and night settings. Product is designed for Poser, Loads OK in D/S with few limitations (check read me). Fits to Supervilla Sets. Change pose in body in ROOM to fit. Check out our other sets and freebie area for more. Preset Poses for furniture will be available soon in our freebie area. five futuristic furntirure props with five different material variations. your figures a real futuristic place to live in. Enjoy this set and get your figures some futuristic place. Check out our other sets and our great freebie area. Tested in Poser and D/S. 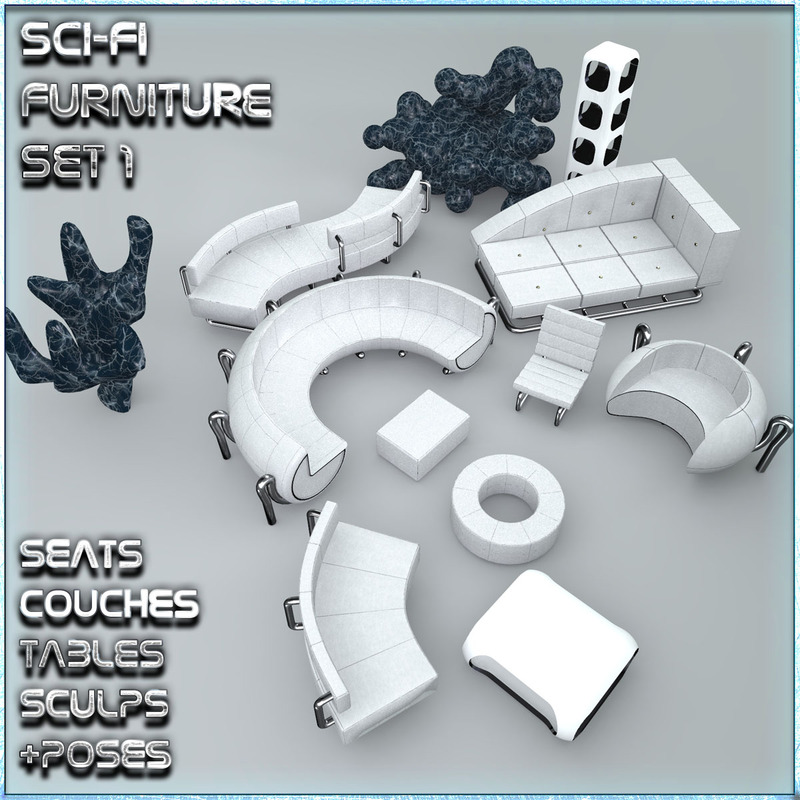 Here comes a versatile set of Furniture in SciFi/futuristic style. Made out of leather, you can apply one of the preset mats coming with it. Also included is a table and a shelf as well as some stylish sculptures. Finally, to make it of most value, we have indcluded 24 Poses for M4/V4 for you. Also check our large freebie area with loads of add on stuff and extra bits for you! Thanks for using our sets! I got a little tired of all this “hip” and “stylish” apartments and newish stuff. So i thought about having a very simple but standard apartment build, about 1000sqft (90 sqm), usually, what people life in. And in conjunction to the other street stuff i am working on, it seamed very clear: This is a must do! To add additional value, the floors and walls are all UV mapped in a way, you can simple swap or apply different floor styles or wallpapers. We added single materials to the set, so simply select the piece of the floor or wall you would like to change and load a different style. Ah, if renovation would always be so easy! There are much more useful freebies in our freebies area! The Entire set is build for external use as well. Check my freebies for additional items such as the streets etc. You waited long enough. Move into your own walls, now! A new Extension Set is avaliable! Remark for D/S Users: The set works in DAZ Studio 2.3 up, however, the loadable material sets that come with this set are designed for Poser. In D/S you must apply the textures by hand in case you want to change the styles.